Charlie Montoyo isn't ready to hit the panic button on his offence despite a glaringly slow start from Blue Jays hitters this season. Toronto entered Wednesday having recorded just one hit and one walk the first time through the batting order in each of its six games. "Players go through slumps and everyone's going through it at the same time early on," Montoyo said before Toronto concluded a three-game series against the division-rival Baltimore Orioles on Wednesday. "It's just not a good feeling for the whole team but they're going to come out of it. I know that's the right thing to say but it really is. "They're better hitters than what they're hitting right now. When that's going to happen, I don't know, but it's coming. Nobody's going to hit .100, we're better than that. We know that." 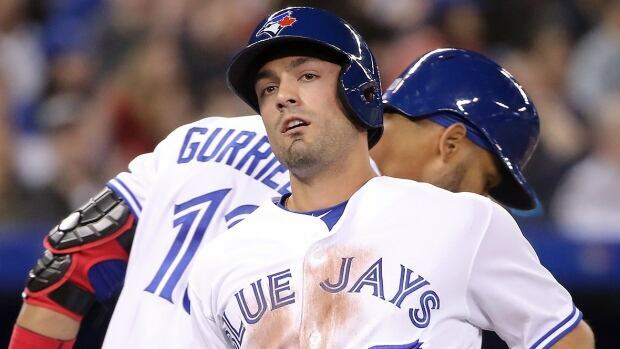 Toronto batted a cumulative .182 with a .251 on-base percentage over the season's first six games. And the Blue Jays haven't exactly faced stellar starting pitching so far this season either. Detroit's Jordan Zimmermann, who held a 4.52 earned-run average last year and a 6.08 ERA in 2017, carried a perfect game into the seventh inning against Toronto in the season-opener last week. Then Baltimore's David Hess, owner of a 3-10 record and 4.88 ERA in 2018, was pulled in the seventh inning of Monday's game with a no-hitter intact. Montoyo said the defence of the Tigers and Orioles has made things more difficult for his hitters. "The right-handers have been shifted, all of them, so that's not a good sign," he said. "We've got to make that adjustment and try to go the other way." We're pulling off the ball ... everybody's pressing.— Blue Jays manager Charlie Montoyo on his team's struggles at the plateMontoyo said there is an effort underway to make that change, noting he had spoken to the team's other coaches earlier Wednesday about switching things up during batting practice to help get the juices flowing and encourage hitters to find holes in the field when the shift is on. The rookie manager also added that the struggles at the plate seem to be having a domino effect throughout his young batting order. "We're pulling off the ball, everybody's doing the same thing, everybody's pressing," Montoyo said. "When somebody presses it kind of goes to everybody else. "Have I ever seen anything like this, the one hit in 50-something [at-bats]? No I haven't. I've seen it now but it's going to change."